Anyone can throw a piece of steak on the grill or a piece of fish in the oven, but it takes a seasoned cook to know exactly when to make adjustments and when to remove your food from heat so that it’s cooked perfectly. At least, it used to take a seasoned cook. 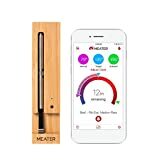 The Meater True Wireless Smart Meat Thermometer can turn anyone into a master chef. Stick it in whatever meat you’re cooking, and then toss it into whatever you’re using to cook it. Meater will monitor the internal temperature and relay that info to the app on your phone. You can see the exact internal temperature at any time, and then the app lets you know when to remove your food from the heat once it arrives at your desired doneness. How awesome is that! ?